If your furniture is haunting you with the smoke smells of the past, then now is the time to take on those odors with your best options. There are several excellent methods and products that can be used right now to help restore your furniture and the environment of your home to something that smells a whole lot better than stale smoke. These methods can be used if you’ve purchased a used item that smells of smoke as well. If you’re dealing with a smoking odor in wooden furniture, take note: it can take several repeated applications to completely remove the smell, no matter which method is being used. DIY Ways to Remove Smoke Smell from Furniture. One common way to remove smoke smell from furniture is to use hypoallergenic dryer sheets. You can place these sheets in the drawers of a dresser, underneath couch cushions, or other areas that are available. The sheets absorb the odors over time, restoring the furniture to its previous glory. Here are some additional methods that are proven to work when you need to improve the odor emanating from your furniture. Baking Soda. If you have furniture with upholstery, you can sprinkle baking soda directly onto the furniture. You can also place an open box of baking soda in a drawer. Change the baking soda every 24 hours until the odor is gone. You can wipe the baking soda away if sprinkled, but vacuuming it up is a better option. Coffee Grounds. Coffee grounds work a lot like activated carbon. Odors are absorbed right away and your home is left smelling like coffee while you’re working out the stale cigarette odors. This method can get a bit costly if you have several items to treat but is quite effective. Most odors can be removed in 48-72 hours from furniture. Vinegar and Water. With a 50/50 solution of vinegar and water, you can remove cigarette smoke odors rather effectively. This method will require you to take the furniture outside unless you want pungent vinegar odors wafting through your home all day. Wipe down wooden furniture with the solution and then allow to dry. An overlooked method of removing smoke smells from furniture is to place newspaper in or around the item. If you have a dresser or cabinet that smells like smoke, then place a layer of newspaper on the interior surfaces. The paper will absorb the odors over time. You’ll need to switch out the paper about once per week for about 1 month to remove the odors. This spray odor eliminator is just as effective as a masking agent for immediate environmental improvements. The difference is that this product will permanently remove odors from your furniture. It is so effective, in fact, that it can remove embedded skunk odors from several different surfaces. You can even spray it in the air to remove cigarette smoke odors immediately. It’s great because the product is biodegradable and non-toxic. This odor eliminator for furniture is designed for pet stains and smells, but it does a surprisingly good job with smoke too. Enzymes within the spray are activated when it hits odors, removing organic matters that can be holding odor molecules. This cleaner is free of chlorine and is color-safe. It’s also non-toxic and doesn’t leave any residues behind. You can even use it on your carpet if you wish to remove odors and stains there. 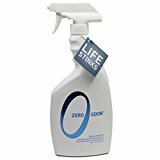 This 3-in-1 odor eliminator provides an immediate improvement to the smells your furniture may be causing. Just spray it onto the affected surface and let it sit there. It works just as effectively on hard surface odors as it does on fabric, upholstery, or airborne odors. You can choose from an unscented version or two perfumed options: mountain fresh or fresh linen. All work well. Extremely stale odors do take several applications to completely remove the odor, but improvements are still immediate. If you don’t like the idea of spraying your furniture with a cleaner, then these air purifying bags can help to remove difficult cigarette smoke odors. It works well with its activated bamboo charcoal, allowing you to place it in a drawer or under a cushion. It traps allergens as it traps odor particles, improving the overall environment of the home. You can reuse these bags for up to 2 years when following the manufacturer’s instructions. This product is rated to remove skunk odors, but it does an incredible job on stale cigarette odors as well. If your furniture smells like an ash tray, this is a quick-fix product that will get the job done. It’s safe enough that you can spray it directly on your pets, but gentle enough that you can use it on fabrics and furniture. Difficult odors may require 2-3 applications of this product, but with a little patience and continued cleaning, the odor will disappear. The best way to protect your furniture from future cigarette smoke odors is abstinence. Don’t smoke around your furniture. If you must smoke inside, be sure to take measures that will prevent smoke particles from spreading to reduce the risks of stale smoke odors becoming trapped in your furniture. Certain masking agents can be used for an immediate environmental improvement, but they won’t actually eliminate the odors. Mist vodka or a deodorizing chemical agent on the furniture and you’ll buy yourself 24 hours. That’s good enough to host a party, but you’ll need to remove the odors afterward. Especially strong odors may require repetitive cleaning efforts or an extended timeframe to be successful. For wood furniture, stubborn smoke smells that will not disappear, no matter how many attempts or products you used, can still be restored with a new coat of paint. Just clean the surface thoroughly before painting. What are your best methods to remove smoke smells from furniture?